Welcome to Nanna's Kitchen! Celebrating 30 Years! 1985 - 2015! 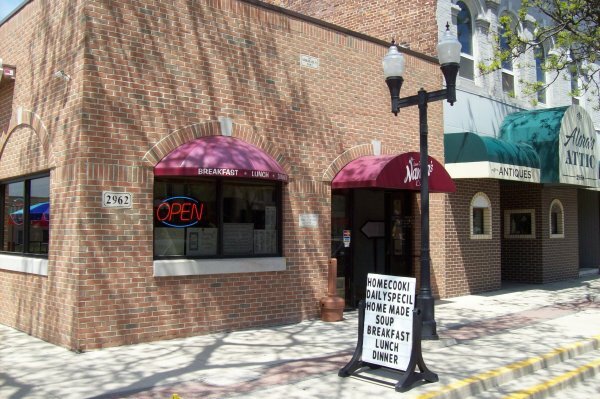 Atef (Steven) and Mary Mikhail’s dream of owning a “mom & pop” diner became a reality in May of 1985 when they opened Nanna’s Kitchen in a small 900 square foot site in downtown Wyandotte. The tiny restaurant seated up to 34 people with all the services provided by Mary and Steve alone. As business improved additional staff came on board. Some of those employees became members of the family over time. Bev and Bob are still with us today after 15 years of dedicated service and loyalty. In November of 1991, following several miscarriages and a difficult pregnancy, Yesmeen Isabelle Mikhail was born. Mary focused on raising their daughter until Yesmeen began attending school full-time while Steve managed the restaurant. In February of 2000 Mary was diagnosed with breast cancer but the couple continued to work hard balancing the restaurant and family despite their challenges. Misfortune struck again in 2001 when Nanna’s Kitchen was lost to a fire that started in a coffee shop located a few doors down. The tiny diner suffered damages beyond repair. By that time Steve and Mary had well established themselves and their “homecooking” in the downtown area and rebuilding Nanna’s was, beyond a doubt, the natural thing to do. Many of the regular customers that came to Nanna’s over the years had become friends as well and assisted in this major undertaking. In September of 2002, eighteen months later, the new 2400 square foot, 60 seat diner now stands in its’ present location. In February 2004 Mary lost her battle with cancer. Throughout her lifetime Mary demonstrated a strong faith in God, a love of family and friends and continuous desire to help others. Even up to the time of her death Mary insisted that she wasn’t ready to go. Nanna’s Kitchen is dedicated to her memory. Today Nanna's serves Wyandotte & the surrounding communities with the best customer service & best home cooked meals available at the best prices. We thank our loyal customers for their continued support & patronage.